This is an excellent documentary on Korean foods and its culture. I came across this clip couple weeks ago on PBS and felt so thankful to WGBH for making this film. 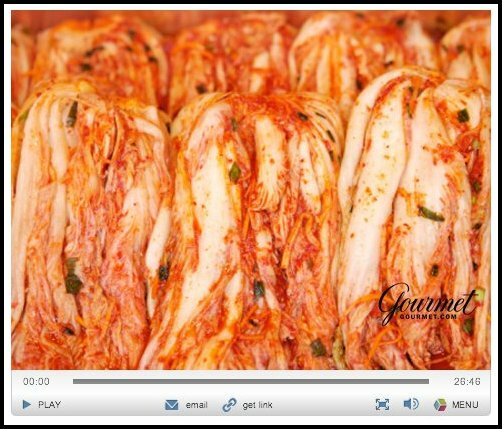 This film captures the essence of Korean foods in terms of its culture and history. I think the Korean foods and its culture are still very much unknown to the western society. Compared to other ethnic cuisines such as Japanese, Chinese, Indian and Thai, Korean foods definitely lack some spotlights. I blame it partially on the lack of marketing by Koreans. Korean government has acknowledge this fact and started promoting Korean foods more widely. For example, the First Lady of Korea showcased Korean cooking on CNN a few days ago, and she cooked Korean foods for the veterans of Korean War in Long Islands. I think this is an excellent move, and I am glad I can also play a role in bringing the Korean foods a little closer to non-Koreans. I love your blog and thank you for this post! Korean food is so delicious, right? you have a wonderful blog. i love korean food! very healthy and spicy.